The technology world is experiencing a lot of experiments with gadgets which had got a lot of transformation during the couple of years. Smartphones had been undergoing a massive change in the screen size which had touched even the 5.5 inch range. Here arose a new generation of devices which falls in between the category of smartphones and tablets. These hybrid devices later came to be called as phablets. Samsung being one of the top global manufacturers had already made fame with their branded product 'Galaxy Note' which became success at international market. Meanwhile their country counterpart LG Electronics has also made their presence with Optimus Vu. Now both manufacturers are again pitted their successor products each other. Considering the number of phablets available in India, there are a lot of local vendors who play a key role in deciding the future of branded products. But, while considering the international market, Samsung already had been making a top run in this category. 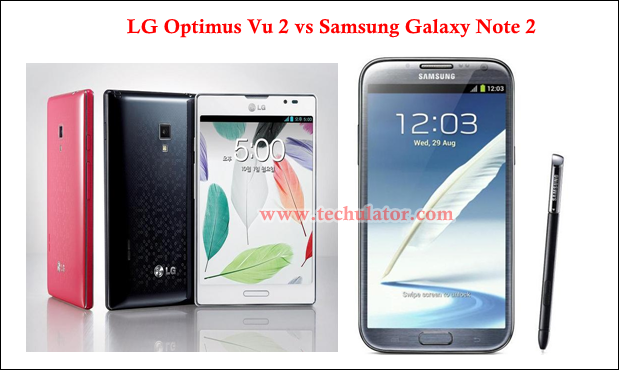 Samsung Galaxy Note 2 and LG Optimus Vu 2 will fight each other for the dominance at global level and also to take away the best Android phablet crown. As both phablets are available in the Indian market its quite interesting to know the comparison of both regarding its specifications, features and price. The LG Optimus Vu is credited with a 5-inch XGA IPS display having 1280 x 768 pixel resolution. On the other hand the Samsung Galaxy Note 2 boots of having a bigger 5.5 inch Super AMOLED capacitive touch screen display with 1280 x 720 pixel resolutions. The Galaxy Note 2 will be ideal for those who are looking for a device with larger display. The smooth design of both phablets would enthrall the users who could use them much conveniently. Both phablets will accompany with digital supports as the stylus included in the Optimus Vu is capable of delivering annotating credentials, drawing sketches and also in making handwritten notes. The Galaxy Note 2 also is supported by S-Pen, a digital device which responses to touch. The LG Optimus Vu is having a dimension of 139.6 x 90.4 x 8.5mm and weighs just 168 grams. Meanwhile the Samsung Galaxy Note 2 which boosts with a dimension of 151.1 x 80.5 x 9.4 mm weighs 180 grams. The LG phablet will be powered by a much improved 1.5GHz quad core Nvidia Tegra 3 processor which gives much faster response to your fingers. Meanwhile the Galaxy Note 2 will operate with the Samsung Exynos 4412 Quad chipset. Flavoured by Android 4.0 Ice Cream Sandwich operating system, the Optimus Vu will not be a competitor for Galaxy Note 2 which is updated with Android 4.1 Jelly Bean OS. The latest update of Android, the Jelly Bean is equipped with a number of nee features like Project Butter, expandable and contractible notifications, live wallpaper preview, resizable app widgets, HD contact photos and much more. Both phablets will have an 8 Mega Pixel rear camera supported by autofocus and LED flash features. But comparing with the front camera in 1.3 MP Optimus Vu 2, Galaxy Note 2 does have a better 1.9MP front camera. On the part of memory, the Optimus Vu will have an internal memory of 32GB along with 1GB RAM. The memory can be doubled with a micro SD card. But the Galaxy Note 2 is available in three versions – 16GB/32GB/64 GB internal storage capacities along with 2GB RAM and a micro SD card slot which supports up to 32GB more. On the connectivity front, both phablets features Bluetooth, WI-Fi, 3G, micro USB 2.0 and NFC which makes your work comfortable even while on the go. Loaded with a 2150 mAh battery, the Optimus Vu 2 is not even compatible with Galaxy Note 2 which is powered by a 3,100 mAh Li-ion battery and boosts of delivering 16 hours of talk time. The Samsung's Galaxy Note 2 is currently available in the UK and will have a majestic release in U.S. on 24th October. The unlocked version of Galaxy Note 2 is being sold on Amazon at $695. While it comes to India the price would be Rs 39,990. Considering LG Optimus Vu 2, the phablet will have an international release very soon. The price is India is fixed at Rs 34,500 which would be a reasonable price comparing it with Galaxy Note 2. Both Galaxy Note 2 and Optimus Vu 2 stand unique at their own way. Those who are looking for a device with less price tag, the Optimus Vu 2 would be the better choice. But for those who could pay a little bit more can experience the Android 4.1 Jelly Bean, better battery performace, cool S-Pen applications, increased internal storage option, larger display, Samsung Galaxy Note 2 will enthrall you. LG already had unveiled its next generation Vu in Korea which will reach the international market very soon. Samsung Star Deluxe Duos S5292Dual Sim phone full specifications and features are given here. As the price of Samsung Star Deluxe Duos S5292 is not yet announced mobile fans have to wait for a couple of days as more information will be available.